Several American Indian candidates won important races last year, two of which are headed to Congress: Deb Haaland (Laguna Pueblo) of New Mexico and Sharice Davids (Ho Chunk) of Kansas. Additionally, Tom Cole (Chickasaw) and Markwayne Mullin (Cherokee), both of Oklahoma, won re-election to Congress. Kevin Stitt (Cherokee) was elected governor of Oklahoma, and Peggy Flanagan (White Earth Ojibwe) was elected as lieutenant governor of Minnesota. A total of 48 Native candidates won election to state legislative offices. According to a count by Indian Country Today, 103 Native candidates ran for office in the midterms. At least 60 won, mostly Democrats — though Oklahomans elected a Republican (Stitt) to be the country’s first American Indian governor. The Latino Decisions Election Eve survey analyzed American Indian voting trends and found that 61 percent reported voting for a Democratic candidate for Congress. Sixty-seven percent of American Indian women reported that they voted for Democrats compared to 54 percent of American Indian men. A North Dakota law requiring prospective voters to provide a street address was upheld by a Supreme Court ruling in October 2018. North Dakota is one of many primarily Republican-controlled states to take advantage of a 2013 Supreme Court ruling eliminating key protections of the Voting Rights Act to make registration and voting more difficult, especially for the poor and people of color, both of whom typically vote Democrat. Sadly, thousands of rural American Indians, on or off North Dakota’s reservations, lack street addresses because their streets have no names and their homes have no numbers. Instead, they rely on P.O. boxes. 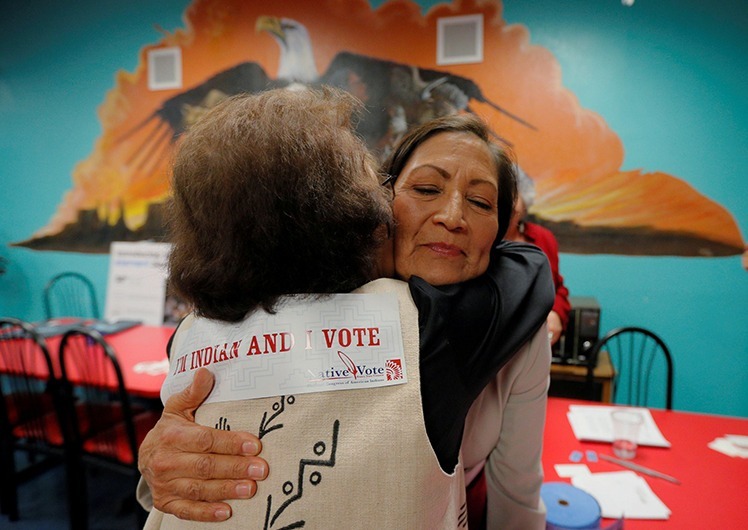 Thanks to a massive local effort to defend their right to vote, North Dakota’s American Indian showed up in record numbers in the 2018 midterm election.